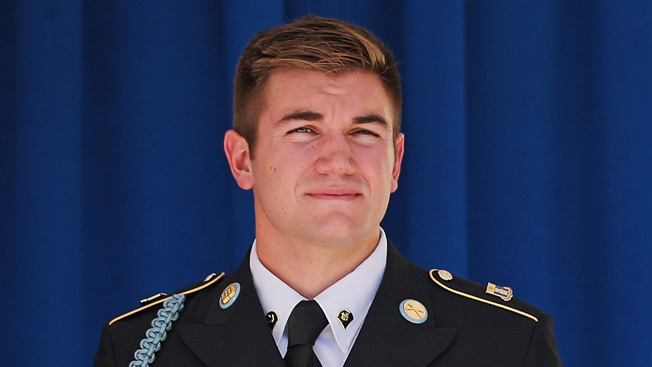 Alek Skarlatos gained fame earlier this summer when he and two other Americans overpowered a would-be terrorist on a Paris-bound train. And that notoriety might have saved his life. Skarlatos is one of the contestants on this season's Dancing With the Stars, and it was during rehearsal yesterday that he heard the news of the shooting at Umpqua Community College in Roseburg, Ore.
"I was actually in the studio with Lindsay [Arnold], dancing, and I got a text from one of my friends telling me what had happened, so I looked it up on the Internet to confirm it and I was just in total shock," Skarlatos told ABC News. If not for his turn on the ABC competition series, Skarlatos, a native of southern Oregon, would have been on the campus. "I would have been there today if the train hadn't happened," Skarlatos told Fox News' Greta Van Susteren last night. "I was already enrolled for classes this fall." While taping an episode of The Ellen DeGeneres Show, scheduled to air Monday, DeGeneres mentioned that Skarlatos was supposed to show off his moves on the show. "There was a shooting in Oregon … So it's not a great day for you to dance," said DeGeneres. "If you weren't on the show right now, you would be there." This morning, Skarlatos was interviewed from Roseburg on Good Morning America. "It's absolutely insane to be in a situation like this," he told Amy Robach. When asked if he would have attempted the same heroics that earned him medals from the U.S. and France and an Oval Office meeting with President Obama, Skarlatos said, "I would have tried, anyway."